Why don't adults get coaching? The 2007 Commonwealth Championship begins on 2nd December. After languishing for a number of years the tournament has taken on a new lease of life in the hands of the Indian Chess Federation. This years event includes junior and womens tournaments and at last count had attracted 280 players. Australia is well represented with IM Aleks Wohl and IM David Smerdon in the Open and WFM Shannon Oliver playing in the Womens Championship. Other Australian players are Gareth Oliver (U20), Jamie Kenmure (U20), Alexandra Jule (U20G), Rebecca Harris (U18G), Benjamin Harris (U16), Harry Hughes (U8). I was doing some group coaching last night at my chess club, and the first position up for discussion was the one shown on the right. It is Black to move and win. This position comes from the game Fish-Abrahams, 1929, although my source was The Power Chess Program by GM Nigel Davies. Now a problem like this is normally pretty easy to solve, but a position like this may not be. So let me explain. If you are shown a position like this the act of it being shown to you is a big clue that some cleverness is afoot. And often knowing there is a solution is half the battle in problem solving. So armed with the knowledge that this is a "problem" trying anything and everything until you find the right move isn't a huge strain. Now there are a couple of other interesting things about the solving process. My intention with this problem (and the others that followed) wasn't to see who could come up with the quickest or cleverest solution, but to aim for a systematic approach. In this case I impressed the need to look at all checks and captures. While most players know the importance of this rule, due to mental laziness we often look at "some" checks and captures. This is because we either dismiss some moves as "stupid" and don't even try them, or more commonly, we look at the first couple of checks or captures and then decide that the third capture (out of 6 or 7) "must" be the right move and proceed to ignore everything else. As an exercise in Checks and Captures it was great, as every Black move is either a check or a capture. As an exercise in disciplined thinking it was also good, as the key move was a move that the casual observer may discard (although the experienced chess player might find simply because it is a chess problem). But there is a small sting in the tail. While trying to impress on the players that Black won by choosing a "less obvious" move, we gave White no such leeway during the solving process. The trap that the group (including myself) fell into was assuming that 2.gxf3 was forced for White, when the non-capturing 2.Ne2 leaves 2 Black pieces still under attack. Of course Black can emerge with an advantage with 2... Nxd4 3.Nxd4 Q runs away, but it isn't the forced mate/win that the combination seems to be. Until now I've avoided the whole social network phenomena, although this is more to do with my laziness than any other reason. But I got pinged today with an invite to join linkedin.com, which is a kind of social network, but aimed at the professional/job hunting market. So I accepted the invitation and filled in all the various details. Now the whole idea of these networks is to put you in touch with people of similar skills/interests or in touch with people who are in touch with people etc etc etc This got me thinking about how such a network might help chess. Lots of chessplayers have a social network of other chessplayers. And some chessplayers have a network of people who aren't chessplayers. But often these networks are quite distinct (and are kept disticnt), meaning that chess doesn't draw on the resources that the non chess community might bring in. But via a mechanism like linkedin or facebook there might be an opportunity for these groups to come into contact with each other, to the benefit of both. So what I am interested in doing is building up a network of chessplayers, both as a conduit for the sharing of chess related ideas (especially in the areas of tournament organisation and marketing), and as a way of increasing the visibility of the chess community through the professional world. To do this I invite you to have a look at www.linkedin.com/in/shaunpress and decide if it is a worthwhile endeavour. I will be interested in seeing what contacts the chess community actually has with the outside world, and what help that can bring to the game. If you are doing any audio processing work under Linux, then Sox is a very useful tool to have. The Sox homepage refers to it as "the swiss army knife of sound processing programs". Unfortunately the new release (14.0.0) has a problem under certain Linux distros. The problem appears when processing .wav files (and maybe others) and shows up with an error message "Could not find data chunk". This is caused by the use of the "fseek0" function call instead of the previous "fseek" function call. The solution is a simple one. In the src/misc.c file change the fseek0 function call to fseek ,then recompile and run make install. Worked a treat for me. The World Youth Championships has 2 rounds to go and most Australian eyes are focused on the Under 12 Championship. Queensland FM Gene Nakauchi is in =2nd place with 7.5/9, half a point behind Ivan Bukashin of Russia. Of the Canberra based players, Ethan Derwent is on 3.5 in the Under 8's while Emma Guo has scored 5 points in the Girls Under 12's. Another well placed Australian is Sean Gu, whose current 6/9 in the Under 8's could turn into a top 10 finish if results go his way. Oceania representative IM Zong Yuan Zhao was an early casualty from the 2007 FIDE World Cup. Zhao had the tough assignment of defeating Magnus Carlsen in the first round, and despite some solid resistance on both games was beaten 2-0. Another player making the early trip home was IM Robert Gwaze, who was defeated 2-0 by Alexi Shirov. Full coverage of the event is here. While the Australian voting public successfully changed the government yesterday, those opposed to Putin's rule in Russia are having a much harder time of it. Opposition figurehead Gary Kasparov was arrested at a protest march and has been sentenced to 5 days in jail. Apparently Kasparov's group had been given permission to hold a 'rally', but not a 'march' and this was the reason he was given time in jail. This story is getting plenty of coverage in the print media (eg The New York Times) and SBS (Australia) News was even covering it this evening. In other news concerning former World Champions, Chesstoday is reporting that Bobby Fischer has been hospitalised in Reykjavik, suffering from 'serious physical problems'. Next weekend the Australian Schools Teams Chess Championship is on in Queensland. One of the teams representing the ACT is the Curtin Primary Girls Team, playing in the Primary Girls Section. As a warm up for the event they have been playing at Street Chess on Saturday mornings. The intention of this is to prepare themselves for the rigour of the event by pitting them against some wily old chessplayers, who have seen (or executed) just about every swindle in the book. As much as coaching you teaches you so much, there is nothing like the pain of an unlucky defeat to really ram home a lesson. But not only are the girls enjoying the experience, the Street Chess regulars have enjoyed having new faces at the tables. And the last couple of weeks have seen fields of 20+ players battling it our for the $100 prize money. This post also gives me a chance to show off a new blog gadget, with a slideshow of pictures from today's tournament located about halfway down the right hand side of the page. With the various extra real estate stealer's on the page (ads, video links, photos, pay pal buttons etc) it is getting hard to find space for everything. And if you find this page annoyingly slow to load, please tell me and I'll see what I can get rid of. "Vote early, vote often" is a piece of advice that often pops up around election time. And with the (Australian) Federal Election on tomorrow, it may be the only thing that will save the Liberal Party from defeat. (Attempts at "False Flag" operations having blown up in their faces). Years ago I appropriated the saying and turned it into a piece of advice for junior players. "Castle early, castle often" I'd say, to the confusion of those in front of me. "You can only castle once" would come the challenge from the more learned children. "Not necessarily" I would reply. And as evidence I present the following semi-famous game. At this point Heidenfeld forgot that he had already moved his King (by castling!) and castled again, on the opposite side of the board. Sadly such imaginative play did him no good. Paul Dunn (www.ozbase.com.au) sent me a game from the 1965 Australian Championship. The games was won by Dr George Stern in only 7 moves, and Paul remarks that "Dr George takes the record for the shortest game at an Australian Championships up until that time." I'm assuming that this record only applies to decisive (and played) games as I'm sure there would be a few players losing by not turning up, and a couple of very quick draws. George passed away a few years ago, and is mainly remembered for his term as chess columnist for the Canberra Times. For the early part of my chess career I had a number of disagreements with George over chess matters, which can be best explained by the arrogance of youth, and the belief I knew better than everyone else. In latter years I apologised to George for my behaviour at the time, but he laughed it off, stating that differences of opinion are to be expected in the chess community. But it did teach me an important lesson about behaviour. When you decide to call someone a "dog", or a "clown", or even a "tool", and feel you are entitled to do so because of your perception of who the other person is, ask yourself that in 20 years from now, will you regret or be ashamed of the things you said? The organisers of the 2008 Gibraltar Masters organised an online qualifying event with the winner receiving an all expense paid trip to the 2008 tournament. The event started out with 1500+ players, with the final being a 16 player knockout. It was a pretty strong event with the final 16 consisting of 9 GM's, 6 IM's and the lone untitled player, Max Illingworth from Sydney. Max (playing under the handle of "MightyMax") had the misfortune to run into the tournament winner Tigran L. Petrosian in the first round. Despite his best efforts, Max went out 3-0. * As you can see ICC seems to regard ratings as a marketing ploy. I'd guess both players are about 700 points ahead of their respective FIDE ratings. 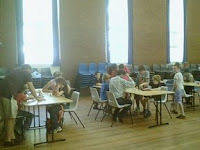 The ACT Transfer Championship was another successful ACTJCL tournament, with 78 players (39 teams) taking part. At this stage I don't have the full results, but the tournament was won by Justin Chow and Etienne Masle-Farquhar (10/11). My own team (Press, Shaun & Press, Harry) started off well 4/4 until we got outsmarted by a team of 11 year olds. Noticing that I was using a lot of my time to help my partner, they waited until I was behind on the clock and stalled. This nullified the effect of having a strong player advising a weaker one. The most drastic effect of this tactic was when I needed to drop a piece to block a check and I had none in front of me. As I was behind on the clock, my partners opponent simply "sat", so my partner couldn't capture anything to pass to me. Of course this strategy was assisted by the use of digital clocks (sacrilege!) which took the uncertainty out of such decisions. We then lost 4 games in a row, before recovering with 3 wins to score 7/11. I'm not sure where that placed us, but we did pick up a trophy for best placed Under 2000 (combined ratings) team. The British Rapidplay Championship was held over the last weekend and GM Peter Wells was the deserving winner with a very impressive 9.5/11. In his last round game he faced a Grunfeld, and chose the 9.Rb1 line of the Exchange Variation. Over the years this move is one that has caused players on the Black side of the board quite a deal of trouble. This game was no different as Wells chased the Black Queen around the board before his strong centre lead to a winning King side attack. (I've even chucked in a couple of other games, including a quick win by Colin Davis, a strong Australian junior who retired far too early). I've seen a couple of reviews, but even they've been a bit sparse. It looks as though it follows the same formula as Chessmaster X, with a whole lot of fancy chess sets and settings, and has the same emphasis on teaching chess, and not just playing. Probably the big difference from Chessmaster X is the multi-platform support, with both the PC and Nintendo DS versions on the shelves. I believe there will also be X-Box versions available as well, although I haven't seen any for the Australian zone. At this stage I would suggest it may be a good purchase for the DS, but the extra cost for the PC version (over Chessmaster X) may not be worth it. The 2007 World Youth Championship begins tomorrow in Antayla, Turkey. Australia is well represented with 17 players over 12 divisions, with a couple of Canberra based players (Emma Guo U/12 Girls and Ethan Derwent U/8 Boys). IM David Smerdon is one of the team coaches, and full coverage of the event can be found on the tournament website. The 2007 Vikings Weekender is only a fortnight away. Full details of the event (including an entry form) can be found on Ian Rout's chess webpage. Of the 3 weekenders held in Canberra (Doeberl and ANU are the other 2), Vikings is the most "local". That is not to say that interstate players aren't welcome, but that it is the tournament that is aimed at Canberra players. Having said that, first place tends to go interstate more often than not. So if you are an interstate player wanting to enjoy a chess playing weekend in Canberra, time to organise your travel plans. And if you are a local player, you might want to show those out-of-towners a thing or two. Like this. Occasionally when I get into a discussion with someone about a contentious topic, I realise that the position they have taken isn't supported by what I would regard as "facts". When I point this out they often say "Well, what are the facts?". To stop my head from exploding I usually cut the argument off stating "We can only continue this discussion when you know what you are talking about" (or more bluntly "Do you own homework"). I'm currently seeing this in online discussions about Elo v Glicko as a preferable rating system. This is a particularly heated topic in Australia, although the heat mainly comes from those who would use it as a stick to beat the current ACF Ratings Officer Bill Gletsos over non-related issues. However for those that don't fall into that category here are a couple of links of interest. Parameter estimation in large dynamic paired comparison experiments is Mark Glickman's original paper on the "Glicko" Rating System. (Note You will need a Postscript reader to look at this file). A summary of the Glicko system can be read here. (This is PDF format). At some point down the track there will be a "Chapter 1", "Chapter 2" and even a "Chapter 978" of this post, but before I get there I'd like to be sure that people who throw around terms like "inferior mathematically" know what they are talking about. I know it is a long way from Australia, but the 4 Nations Chess League (4NCL) is underway for another year. Rupert Jones (Bd 3 PNG) is particularly keen to spread the word about this season as the team he manages, White Rose, currently shares the lead in Division 2, and is already looking good for promotion to the top section next year. In Division 1 a couple of Australian names have turned up with David Smerdon turning out for The AD's (replacing Ian Rogers? ), while Alexandra Jule is playing for the Barbican 2 team. John-Paul Wallace is registered with Guilford-ADC, along with 16 GM's. The Victorian Chess Championship is just about to start and already there is a debate about formats. Unlike the poorly performed NSW Championships, the Victorian Championship usually attracts a stronger field, and isn't afraid to try different formats. For this years event they have moved from a multi week event (with 1 or 2 rounds a week) to a more compressed format with all games being played between the 15th and 25th of November. Of course this change hasn't pleased everyone, just as the longer format didn't please everyone either. To me the obvious conclusion to draw is not that one format works better than the other, but that chess players will always whinge about something. Following on from that is my question. Why don't State Associations organise their Championships over a long weekend? I've already flagged this before, with the suggestion that the Queens Birthday Weekend be the obvious (common) weekend (OK not all states celebrate it), to hold State Championships. What would be the pros and cons of having a 3 day 9 round event to decide the State Champion? Sure it would be a grueling schedule (3 90m+30s games in day), but the format may change to 8 player RR's to alleviate this. Certainly I would be interested in seeing the ACTCA move to this format (8 or 10 player RR's, with multiple sections seeded on rating, and with event winners being promoted next year), but then again I'd like to see the ACTCA do something (anything) in the area of chess. Paul Dunn (maintainer of the Ozbase games database) sent me the following game between Guy West and Ian Rogers. Rogers was still only an IM when this game was played, while West had yet to earn his title. The game is remarkable in that West won in only 12 moves. Even more remarkable is the finish, where it seems that both players missed a save for Black (and wins for White). The most obvious question is that of the game itself. Is the score accurate? Although the event is organised by the Junior Chess League, it is open to players of all ages. Indeed to encourage this a number of special prizes are awarded including oldest team, best parent and child score, and biggest age difference. The only difficulty that a returning player might face is getting used to the fact that "no drop for mate" no longer applies, allowing the more vulgar way of ending the game to occur instead. Just as the Doeberl Cup announced its rules in Mobile Phones/Electronic Devices, news has come in of a player being caught using Pocket Fritz on a PDA during a Dutch League match. The player concerned was rumbled by the arbiter, after going outside for some "fresh air". The player was instantly forfeited and banned from chess playing in or captaining a team in the Dutch League for the next 2 and a half years. Full coverage of the incident is here at Chessvibes, and Chessbase looks at it as well. Originally this post was going to be about good and bad positions, and a good combination might not be enough to get you out of a bad position. I even had a game as an example from earlier this week when I set up what I thought was a clever combination, but still ended up with an average position (which I then lost). When I looked over the game concerned I realised it wasn't my position that was at fault it was the fact that I simply miscalculated my combination and simply missed a good win. In my defence I was short of time, but this is a lesson in itself, as the position reached in the game was still good for me, but I had spent so much time calculating my moves I wasn't able to defend it with less than 60 seconds on the clock. The website for the 2008 O2C Doeberl Cup is now online. Visit www.doeberlcup.com.au to check out the prize list, venue and tournament structure. You can also enter online, or download an entry form. What happens when both players give up the f pawn? Well in one of my games last night I reached a position where both players gave up their f pawns. I started with a Kings Gambit and my opponent declined the offer with 2. ... Nc6 and 3. ... f6. I decided to swap on e5 (in part hoping for 4. ... Nxe5??) but after 4. ... fxe we reached a normal king pawn position with both players minus the f pawns. So I decided to play it just like a King Pawn opening, wondering what difference the missing f pawns would make. Although unfeeling computers would evaluate most of this game in White's favour, I pretty much hated my position all the way through. I was quite relieved when my opponent thought for too long in the final position and lost on time. A question often asked by adults who like to gripe about all the resources being directed into junior chess. There are probably a number of answers (time, interest etc) but my favourite comes from ex-junior chess organiser Libby Smith. To paraphrase a response I once read she says "If you want coaching, why don't you organise it. Unlike children, adults should have the skills to put something like this on, without getting your mum to help you"
While not connected to the above statement, the adults at the ANU Chess Club have decided to organise some coaching over the summer. When the current competition finishes (in a weeks time), the club will run some small group workshops on various chess topics. At this stage it is going to be pretty free form, with a combination of study/talks/quizzes designed to help club members improve. So if you are live in the Canberra region and are interested in joining in, feel free to contact me. I will happily pass your interest onto Stephen Mugford who is the chief organiser. It will be held on Wednesday evenings (venue TBA) and there will be no charge. In Steiner's book "Kings of the Chess Board" he annotates Szabo v Lundin from the 1948 Saltsjobadan Interzonal. What is interesting about this game is that it is a Benko Gambit, before there was the Benko Gambit. In his notes Steiner refers to it as a "Blumenfeld Gambit" although he does note that the Blumenfeld Gambit starts with 1.d4 Nf6 2.c4 c5 3.d5 e6 4.Nc3 b5. Now while Benko's chess career had started by this stage (and Steiner discusses him in the book) I haven't been able to find any games by Benko that use the "Benko" before this. Of course the variation is also known as the "Volga Gambit" but I have been told that to use this name within earshot of Pal Benko is asking for a ticking off. One of the organisers of the 2008 Australian Championship, Shane Burgess, has been in touch to let me know that GM Darryl Johansen is now a confirmed entry for the event. Updated entries for all events are now available here. I note that 33% of players in the Championship (3/9) are listed as playing for overseas federations, so I guess the ACF's temporary exemptions for the 2005/06 Championship in Brisbane have now become permanent ones. A couple of years ago I was traveling between Canberra and Oberon (about 235km north of Canberra), when I stopped in the village of Taralga to look at a second hand book store. To my suprise I picked up a first edition copy of "Amongst These Mates" by Chielamangus (really CJS Purdy). Well I passed through the same village yesterday and dropped into the same bookstore on the off chance of anything new (or old). Amazingly on the shelf was a copy of "Kings of the Chess Board" by Lajos Steiner for $5. Even better, it was a signed copy. I asked the proprietor whether there was a reclusive chess book collector hidden in the hills, selling of his collection one book at a time, he replied that it just turned up in a box with a whole lot of other (non-chess) books. He didn't realise it was a signed copy as he suggested $50 would have been a fairer price, but he was only joking when he said this. Here is a quick win from the World Junior Championships held last month. As I will be out of town for the next couple of days, blogging will be light, if at all. The International Correspondence Chess Federation have confirmed the GM title for Chris Fenwick and the IM title for Les Rowley at their 2007 Congress. Congratulations to both players. And in other CC news ICCF President Med Samraoui has been released by Spanish officials, but has not been given permission to travel home to Germany at this stage. I've been playing around with my video record/edit/produce setup and have been able to generate some better results. Attached is some vision I recorded last night at the ANU Chess Club. There is some general shots of the club (highlighting the well lit and spacious facilities!) and then a quick grab of a game between Emma Guo and Jonathon Kocz. I've even been able to add some audio commentary over the top. The conversion process involved recording in 3GP format (2 clips), converting to avi format, then combining it using some video editing software (and attaching titles and commentary). It took about an hour from conversion to production, the hardest part being the actual commentary (which probably sounds naff anyway).Many thanks to Jonathan Paxman for the tip about "Super" conversion software. Of course it may seem a little bland, but it is early days (at least for me). To this end, it is worth remembering that the biggest grossing film of 1896 was "Man walking down street".